If you’re planning to come into the studio to record, there are a number of things you can do to make it easy for yourself, your band, and your engineer. One of the most helpful things you can do is to practice at home playing along to a click. For studio newcomers, this is usually the most stressful part of getting used to recording; learning to play your song in time to a metronome. It’s something that I recommend practicing at home, well in advance of your recording session, where the clock is ticking and the money is adding up. Like everything in life, there are pro- and con- camps when it comes to playing along to a metronome. Here are the things you’ll want to consider. 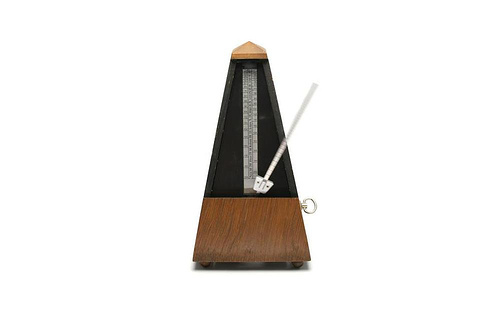 Some people will argue that playing in time to a metronome will make your performance feel robotic and soulless. This is true, in some cases. However, it’s worth noting that once you learn how to play to a click track, you can learn how to play along loosely, allowing your natural instincts to override the strict rhythm at critical moments. I will argue that the advantages here outweigh the disadvantages. Playing along to a click track will ensure that every instrument you track is in time with every other instrument. It also means that we can punch you in clean to fix a small mistake in your performance. Punching in on a freeform track is difficult to time. It requires you to catch up to the ad-libbed tempo perfectly, adjusting to the natural fluctuations of a human timekeeper. When a click is in place, it will also allow your engineer more precision when cutting or quantizing parts of your song. If you sing a little out of time for a few seconds, this is east to fix by aligning the part to the tempo grid. Without it, it’s a trial-and-error approach with no guarantees. Whether you’re planning to use a click in the studio or not, it’s helpful to learn to play along with one anyway. It sharpens your rhythmic sensibility, and trains your ear to detect patterns and follow along in real time.